1948: Awarded Life Membership of the East Fremantle Football Club. 1988: Inducted into the Western Australian Institute of Sport’s Hall of Champions. 1995: Inducted as an inaugural member of the Fremantle Football Club’s Hall of Legends. 1997: Selected in the East Fremantle Football Club’s Team of the Century. 1998: Inaugural Inductee of the City of Fremantleâ€™s Sporting Wall of Fame. 2000: Selected in the West Australian Newspaper’s Team of the Century. 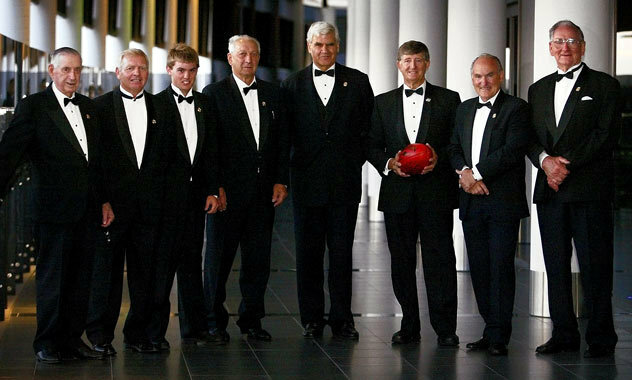 2002: Inducted as a Member of the Australian Football League’s Hall of Fame. 2004: Inducted as a Member and Inaugural Legend of the West Australian Football League’s Hall of Fame. George Doig at left, age 91. Barry Cable, * (great nephew of George Moloney), Don Truscott (youngest son of W.J. (Nipper) Truscott), Polly Farmer, John Todd, Merv McIntosh, Bill Walker.